If you find yourself in Downtown Columbus around lunchtime and you’ve got a few extra minutes on your hands, you have a great opportunity to stray from the beaten path. 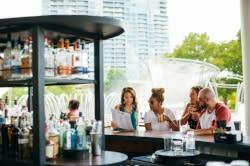 Pick from the area’s best bites and enjoy that food in a beautiful park for a truly relaxing interlude to your day. First up, on Gay Street, you’ll find Tip Top Kitchen and Cocktails . Order the sweet potato fries. They’re so addictive, and come with spicy aioli for dipping. Sweet potatoes are healthy, right? While you wait for your order to come up, why not indulge in a drink? The Bottoms Up (whiskey and RC Cola garnished with a cherry) is only $3 all day, every day. Just down the road is El Arepazo , a pan-Latin restaurant on Pearl Alley. Pick up an arepa, which is a corn cake sandwich filled with meat and/or veggies, popular in the owner Carlos’ native Venezuela. The real show stopper here is the creamy, green sauce that comes on the side. You’ll want to order extra. El Arepazo is very popular, so arrive a bit before or after noon for a shorter wait. For Downtown dessert, it’s hard to do better than Sugardaddy’s Sumptuous Sweeties . They’re famous for their brownies and blondies, packed with imaginative flavors. My favorite is the fiery brownie – with lots of ground hot pepper to add a memorable kick. You’ll need somewhere to eat, because great food deserves a great atmosphere, and there plenty of parks within a few minutes’ walk. My nearby favorites are the new Columbus Commons and the Topiary Park . Columbus Commons has lots of shaded tables, a carousel and a free library of books to peruse while you eat. The Topiary Garden is a hidden gem. Mature trees provide shade, and the finely manicured topiaries recreate Seurat’s famous A Sunday Afternoon on the Isle of La Grande Jatte. What’s your perfect combo for a downtown lunch?